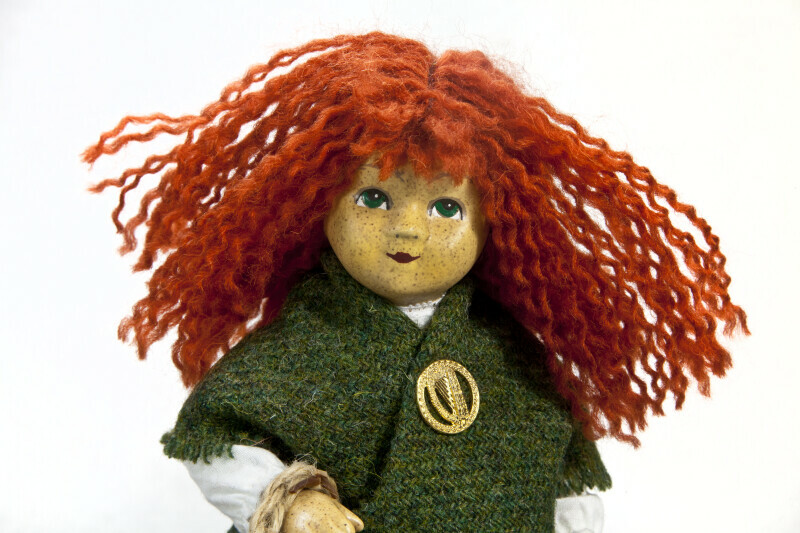 Close up picture of your girl from Ireland. She has wavy red hair made from yarn. Her head is ceramic, and her face has green eyes, and freckles. She is wearing a white blouse with a green shawl that is fastened with a gold Celtic pin of a harp, the official emblem of Ireland. Tag says: "Handcrafted in Rathkeale, Co. Limerick, Ireland -- Collectors Item No. T97An1276 by Marie Enright." This figure stands 8 inches (20 cm) tall.